I suppose it’s been awhile since I wrote anything, and I should. If for no other reason than someday our grandkids will ask why we were so lame in July of 2017. Well, our adventures continue, it’s just that lately they’ve been shorter and closer to home. 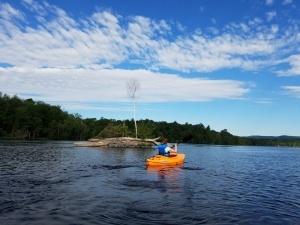 And I realized today that, even though we quite often go out kayaking, I haven’t written once about our time paddling!